Lat 17 40' 0S Long 168 25' 0E Efaté Island is roughly circular in the center in Shefa Province in Vanuatu (Republic of Vanuatu, New Hebrides). Also spelled Efate. To the north is Havannah Harbor and Moso Island to the north and Leleppa Island to the northwest. On May 27, 1942 U. S. Marines Corps (USMC) from the forward echelon of squadron VMF-212 arrived to to begin construction of airfield. Two days later on May 29, 1943 additional Marines arrive on Efate. 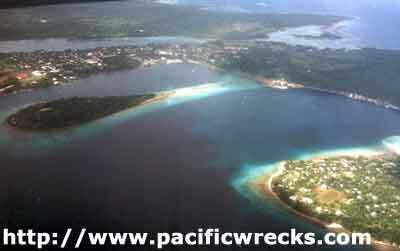 During the remainder of 1942 and 1943, developed into a base area with two airfields and a seaplane base: Bauer Field (Via, Port Vila Airport) and Havannah Harbor Airstrip (Fighter Strip) plus Havannah Harbor Seaplane Base. The bases on Efate supported the Guadalcanal Campagin and later the American advance in the Solomon Islands. Pre-war town on the island, located on the south-west coast. Today, it is the capital city of Vanuatu.